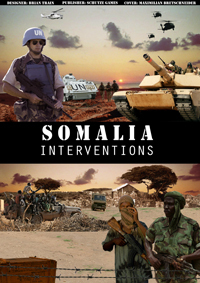 This game simulates the United Nations intervention in Somalia. 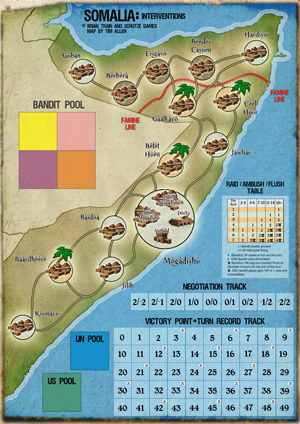 Conflict takes place between the United Nations (UN) player and the Bandit player, as each side tries to achieve differing political and military objectives. The ground scale is abstract as the map is divided into larger or smaller geographically based Zones. The time scale is about one month per turn (hence three per season, and twelve per year) while the troop scale is also somewhat abstract (battalion to brigade size for the UN/US and ‘gang’ size for the Bandits). This is the 2010 updated version. Also comes with Sword of Dubya variant from Brian Train. Gene Dickens 9 8 9 Much improved graphics, very professional for PnP.